Sweet Monkey Backpacker Hostel i Langkawi, Malaysia: Reservér nu! Cancellation Policy: Up to 3 days advance notice before the arrival date is required. 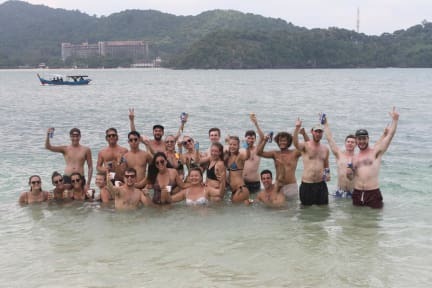 Located on the main road, where everything is happening and just downstairs to heaven, Sweet Monkey Backpacker Hostel is here in ‘Cenang’, top tourist spot of Langkawi, in a walking distant to food, shopping and happening night life on the beach. We are at the orange building next to the well-known Underwater world and opposite Secret Recipe Restaurant. Here we create a friendly budget home for you, fellow travelers. If you like 'privacy' and 'quietness', this may not be what you are looking for. Kitchen area with microwave, toaster and fridge. I had an amazing stay at sweet monkey backpacker hostel! the atmosphere there was so good, and the staff was so nice. I couldn't feel anything but welcome there. 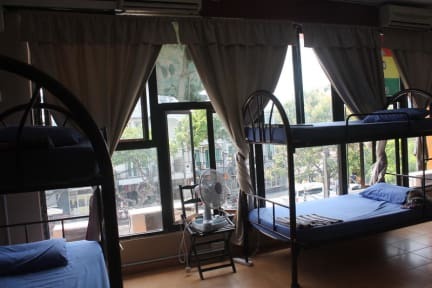 Even though the common room and the big dorm was kind of the same room, there was not much noice because the staff was good and strict about that. They helped me so much and were concerned about my wellbeing (I had a sprained ancle). Over all a very pleasant stay! And they have free toast for breakfast, including topping.